A "Glasshouse" - premises for the making of glass - appears to have been established in Nottingham in the 17th century, and continued in operation for some considerable time. It is thought to have been located at the south end of Sneinton Street, near (or at the corner of) Barker gate (in what was once known as Count Street. A second, apparently less important glassworks was located to the north of the old town which gave its name to Glasshouse Street. Both are mentioned by Blackner, in his History of Nottingham' (1815) where he says "Formerly there were two glasshouses in this town: one at the east end of Sneinton Street of very large dimensions, and one between Charlotte Street and York street, near the end of Glasshouse Lane"
In the parish registers of Greasley in October 1670, the is the marriage of "John Pilmey, Glassmaker" - unusual that his actual trade is mentioned in the parish register, but perhaps indicative of a degree of novelty in this area. Next comes a reference in Thoroton's Antiquities of Nottinghamshire from 1677 to Nicholas Strelley who, having been of that once landed family of Strelley Hall had, (says Thoroton), fallen on adverse circumstances and "lives now in Nottingham upon some ingenious Manufactures in Glass, which he spins and orders very commendably". 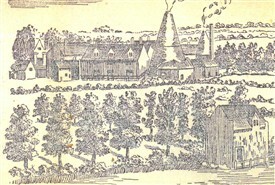 No depiction of any glassworks can be seen in Thoroton's engraved prospect of Nottingham contained in his book of 1677, but it is believed that the Sneinton glassworks would have been established in that area when Thoroton was writing, as in 1679-80 Stapleton (1) records mention of "the Glasshouses near Carter gate"
In 1693, meanwhile, there is reference (2) to an article written about the trades of Nottingham which mentions the making of "glass pots" from the so-called Crouch clay from Derbyshire. Celia Fiennes visited Nottingham in 1697 and mentions that "They make brick and tile by ye town" and that "There was a man that spun glass, and made Severall things in glass-birds and beasts. I spun some of the glass, and saw him make a swan presently with divers Coull'd glass. He makes Buttons wch are very strong and will not breake" (3). "The chief manufacture carried on here is framework-knitting of Stockens the same as at Leicester, and some Glass and Earthenware. The latter is much increased by the consumption of teapots, cups &c, since the increase in tea-drinking, as the Glasshouses I think, are of late rather decreased; a proof one would think that the luxury of the males is less predominant than that of the females; or rather, as some would say, that the men are brought over by the ladies to join with them in the love of the tea-table. And, indeed, the latter seems pretty much the case; whether it be owing to gallantry and complaisance, or to effeminacy and indolence, let those concerned in the observation answer"
Next in evidence for Nottingham's glass-making chronology comes from one of the well-know 18th century views of the town. that of the south prospect published by Samuel and Nathaniel Buck in 1743. Ten of Nottingham's most prominent buildings are numbered, No.8 being identified as a "Glass House". The engraving shows a tall cylindrical cone (or 2 cones?) at the extreme east end of the town (confirming the Sneinton Street location mentioned at the beginning of this article), rising high above the house tops and emitting a great plume(s) of smoke. (See illustration above). The site of the works cone is probably shown on Peet and Badder's map of Nottingham of 1744 in the form of a square block at the south end of Sneinton Street, facing Southwell Road (formerly called Glasshouse Lane). The Nottingham Poll Book of 1754 includes the names of Thomas Hogg and Henry Towell, "glass-makers" living on Barker Gate - that road running to join Sneinton Street. The Nottingham Castle Museum holds examples of Nottingham-made glass, some bottles bearing the makers name "R. Hawley" and the date 1758 - but not definite indication that these were made in the city. From 1769, however, the museum does hold a glass jug of green tint with white spots stated to have been "made by James Woodward, glass blower of Nottingham". Finally, the Nottingham Date Book has reference to "the old glass house, near the Clay Fields" in 1773. This may be the last contemporary reference to glass-making in the city, as by the time Thomas Quincey published his 'Short Tour in the Midland Counties of England' of 1772-74 informs us that "the making of glass wares is laid aside, and that of pots become very trifling". By 1815, meanwhile, Blackner in his 'History of Nottingham' states that both glassworks had disappeared. This page was added by Website Administrator on 11/08/2016.